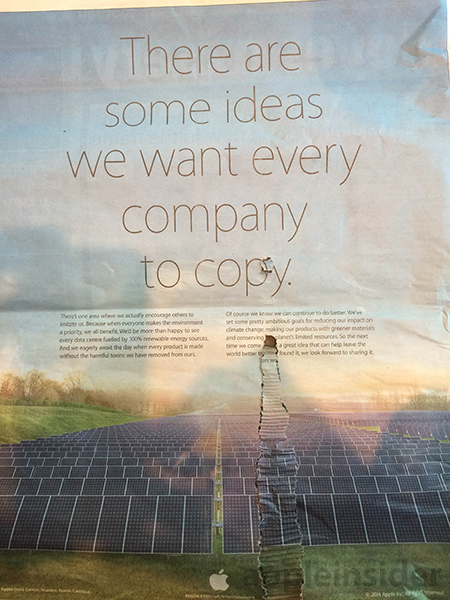 Apple gave its legal adversaries a bit of a ribbing on Tuesday as the company took out a full-page ad in UK newspapers saying, "There are some ideas we want every company to copy," alluding to Apple's environmental awareness [updated with a high-quality image]. The tongue-in-cheek jab, spotted by AppleInsider reader Janak, is likely in reference to Apple's ongoing court battle with Samsung. Apple is suing the Korean company over alleged patent infringement in multiple jurisdictions including California, where a second jury trial is currently underway. 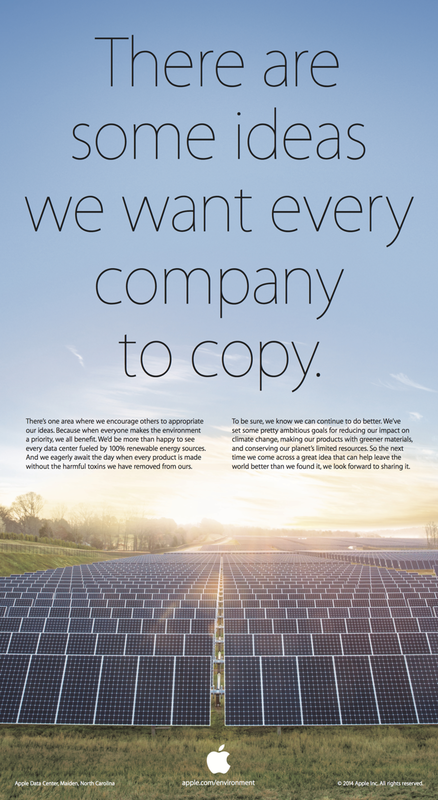 The ad's text is overlaid atop a picture showing off Apple's gigantic solar array —the largest end user-owned facility in the U.S. —that powers its data center in Maiden, N.C. At the bottom of the page is a URL directing readers to Apple UK's environmental responsibility webpage. Apple's ad comes on the heels of a public push touting the company's environmental initiatives. On Monday, the company launched its "Better" campaign with a short video in which CEO Tim Cook named various Apple initiatives created to foster environmentally sound business practices. Tuesday's ad rolls out alongside a redesigned environmental responsibility mini-site that educates visitors about Apple's green initiatives like hardware recycling and the use of renewable energy at data centers, corporate buildings and retail stores. In addition, Apple Stores received special treatment for Earth Day as outlets around the world changed the color of the Apple logo's leaf to green. The modified trademark was also found on retail store employees, who donned green t-shirts and special ID cards to commemorate the event.